Let's put the disappointment of the German GP behind us and look forward with optimism for the Hungarian Grand Prix. Seb and Kimi need good results to go into the summer break on a high. Let's hope they can pull it out! Hopefully Ferrari come out on top with RBR between them and Merc. Should help the point deficit after yesterday's bitter pill. This track is more closer to a normal race track, than a street circuit like Monaco. I see no reason why Ferrari cannot be strong here. Logically Red Bull should be going into this weekend as favorites. But they weren't that competitive last year. 5th and 6th i qualifying and 5th in the race. Ferrari, as we all know, scored a 1-2 in both qualifying and the race. Merc 3-4. But this year the Ferrari has a 10 cm longer wheelbase and probably will not be as nimble in sector 2 as last year. Also RBR has taken a step forward this season. So all in all they may very well have jumped Ferrari on this type of circuits. That was the story in Monaco although the Hungaroring isn't exactly the same. Merc are probably the same as last year and they will hope to score good points without any big expectations. Hopefully we don't trade places with RBR with Merc in between. Ferrari with the most aggressive choices of the front runners. It's a little bit strange that Pirelli didn't bring the hyper softs to Hungary. Maybe they should have selected one step softer tyres (soft, super soft, gap, hyper soft)? Do the FIA want sure two-stoppers or not? Guess not. It’s between vet vs Mad max for the pole. I hope their teammates kimi & DR do well n quali ahead of mercs. That’s wt needed. Yes. Last year the difference was some 3 tenths down to Merc and a further 2 tenths to RBR in qualifying. Hopefully Ferrari haven't lost all of it. If we lose pole and/or the front row then hopefully we're right behind the ones that get it. We must not be the 3rd package here. Looks like the Hungarian GP isn't the only one that's dammed. is it possible for Ferrari to use last years chassi with some tuning for twisty circuits that they were strong on last year like hungary and singapore and the current chassi for other races? Ferrari's last years car is maybe even worse than this year's Haas one. If VET beats Hamilton, I'll take it. Especially with 2 power tracks coming up (Spa, Monza) which should be very good for Ferrari. I have high hopes for Hungary. We have to after last race, and it'll be good to go into break on a high. This season has been a real roller coaster ride. I really hope we can pull out a 1-2 this weekend. Some stats regarding Monaco and Hungary. Since 1986 both races have been in the calendar. That's 32 seasons. The same team has won both races the same season on 13 occasions. 1988, 1991, 1992, 1994, 2000, 2001 (Ferrari, MS), 2005, 2007, 2008, 2010, 2013, 2016, 2017 (Ferrari, SV). Getting on pole at both races for the same team the same season is even more frequent. 17 times. 1986, 1987, 1988, 1991, 1992, 1993, 1994, 1995, 1996 (Ferrari, MS), 2000 (Ferrari, MS), 2007, 2010, 2011, 2013, 2014, 2015, 2017 (Ferrari, KR/SB). But getting on pole at both races doesn't mean it's the same thing as winning them. That has to be underlined. For instance Michael scored both poles in 2000 but didn't win any of the races. Mika scored all four poles in 1998-1999 but only won two of them. The only driver/drivers and/or team combo that have scored pole at both races the same season and also won both races that season are the following. 1991: Senna/McLaren. Both poles and both wins. 1994: Schumacher/Benetton. Both poles and both wins. 2007: McLaren-Mercedes (Alonso/Hamilton). Both poles and both win for the team. 2010: Red Bull-Renault (Webber/Vettel). Both poles and both wins for the team. 2013: Mercedes (Rosberg/Hamilton). Both poles and both wins for the team. 2017: Ferrari (Räikkönen/Vettel). Both poles and both wins for the team. So historically it doesn't bode well for Red Bull if Max or Ricciardo get the pole on saturday. It's hard to win them both from pole the same season. Only Ayrton and Michael have done it. Don't worry guys, Vettel will get pole on Saturday. Kimi just needs to get his act together, it could be an all red front row. I seriously believe that Red Bull is going to fight for 3rd row. Hungary is not Monaco and this is a track where Vettel has historically gone well and like always, he can make a difference when it counts, i.e, Q3. But one thing is sure, it's going to be quite an exciting qualifying! Seb would be leading this championship by a mile mistakes for what ever reason are costly ferrari have the car no doubt its all about mental toughness and holding your nerves harnessing your emotions and packaging it all together on race day he needs to do this and quickly lewis love him or not has this ability under control that is what will define this years wdc . we want redbull on the second row. Kimi needs to his act together and join Seb on the podium ?? It's Kimi's points that are keeping Ferrari in the WCC race. Seb losing in Germany will be hard for him to forget, esp. knowing the guy in 14th place won. Kimi is in on the Ferrari race for WCC, whatever it takes. Even moving over for the mistakes king. Meanwhile Max lost out on his title "Crash King" replaced by Grosgean, Max sees podiums and points for his team, he's within a point of his #1 partner Dan. Ferrari is still in it, big time ! That Kimi who was sleeping in the first 8 races? Hamilton's consecutive mistakes in many races also helped Ferrari to close the gap in Drivers and Constructors. And no, Seb won't think long for Germany, this is not the first time he lost there. Why don't you go to Mercedes forum and praise hollow winner and champion Hamilton there? My favorite driver is Kimi . He gets those podium points for Merc, oh , I meant Ferrari. Hamilton is a hollow winner acting like winning that race was a big deal. It wasn't like he came from 15th place and won. He should have handed his trophy to Seb like Michael did to Rubens back in Austria 2002.. You reminded me that Schumy Jr. messed up before in his homeland Germany, I forgot that. Stop the bad mouthing of Schumy Jr. ! He still has hope both for his team and his WDC. You talking about him losing in Germany before is in the past , let it go! If Seb can forget this last race you should also try! MS also retired from a wet German GP in 2000. (which was the 11th race of the season just like this year). MS last title previous to that was with the Renault powered Benetton 5 years earlier. Seb's last title was 5 years ago in the renault powered Red Bull. Nice work, both of you. It had a similar effect on the championship, Mika took 6 points out of Michael's lead (different points system). But atleast Michael was still leading by 2 points. This season has been a real roller coaster ride. yep, both teams and drivers feeling the pressure. But one accusing the other of illegality and wants fairness.....so it runs to the FIA....crying for clarification. They never did before because of their dominance. Now all of a sudden, the competition has caught up with them. Their true colors are showing.....and it's not silver. 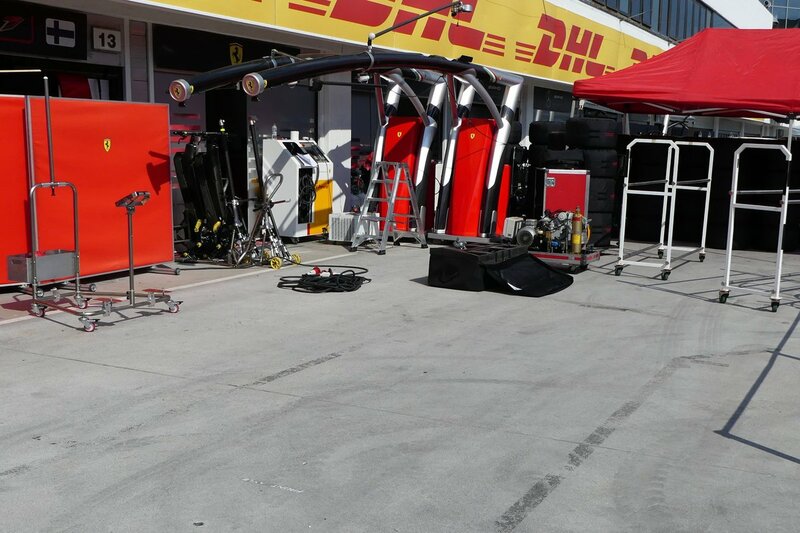 Surface in front of garages was sandblasted ahead of the Hungarian GP for better grip to avoid accidents as they happened in DTM. Big test ahead for surface: Could have some heavy rain on Saturday and Sunday. rain is the last thing we need, honestly. when you have the better package. I am going tomorrow morning to Budapest!